In September, US national home prices continued to rise but at a slower pace. Moreover, two metro areas experienced home price declines in September. The Case-Shiller U.S. National Home Price Index, reported by S&P Dow Jones Indices, rose at a seasonally adjusted annual growth rate of 4.6% in September, slower than the 6.9% increase in August. On a year-over-year basis, the Case-Shiller U.S. National Home Price Index rose by 5.5% in September, the lowest level since January of 2017. The Home Price Index, released by the Federal Housing Finance Agency (FHFA), rose at a seasonally adjusted annual rate of 2.2% in September, down from 4.9% in August, confirming the deceleration in home prices for this month. As well, the S&P/Case-Shiller monthly US Home Price Indices for September was released Tuesday. 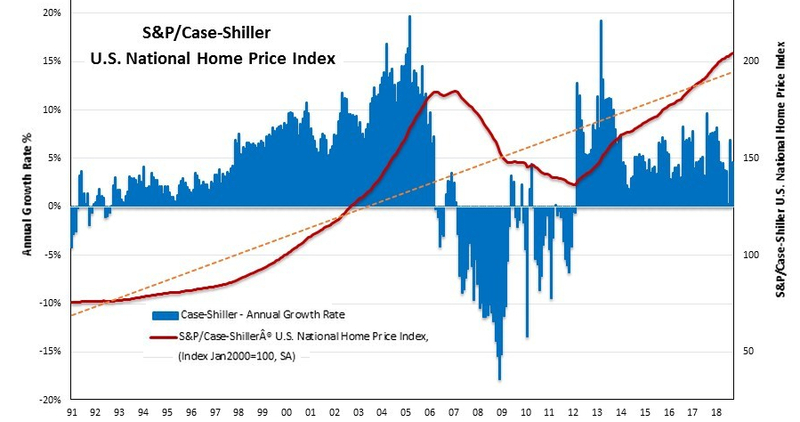 The S&P CoreLogic Case-Shiller U.S. National Home Price NSA Index, covering all nine U.S. census divisions, reported a 5.5% annual gain in September, down from 5.7% in the previous month. The 10 City Composite annual increase came in at 4.8%, down from 5.2% in the previous month. The 20-City Composite posted a 5.1% year-over-year gain, down from 5.5% in the previous month. 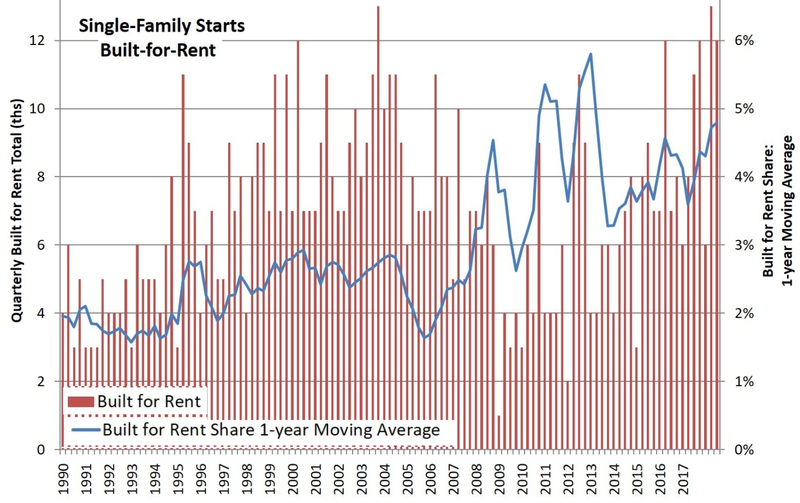 The number of single-family homes built-for-rent increased over the last four quarters. During this time period, construction starts of this type of housing totaled 43,000 homes, compared to 33,000 for the prior four quarters. There were 12,000 single-family built-for-rent starts for 3Q 2018. the built-for-rent share of single-family homes is considerably smaller than the single-family home portion of the rental housing stock, which is 35% according to the 2015 American Community Survey. According to data from the Census Bureau’s Quarterly Starts and Completions by Purpose and Design and National Association of Home Bbuilders analysis, the market share of single-family homes built-for-rent, as measured on a one-year moving average, stood at 4.8% of single-family starts as of the third quarter of 2018.